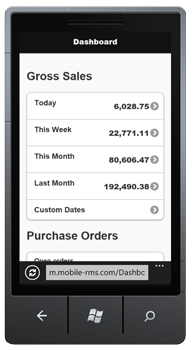 mobileRMS is a subscription service, the pricing is on a per year basis. A Single Licence allows you to log in on any device but you are limited to using the app under one cashier. The Multi User Licence allows you to login as any cashier on any device. The Dashboard gives you a quick but full overview of your sales and costs, you can drill down into the sales data to see sales by department, category and cashier and tender, you can also enter custom sale dates to retrieve the data you are looking for. Sales data can then be compared to the same time last year. In contacts you can look up customer and supplier information, you have a map option which will link to Google maps, you can even call or email directly from mobileRMS. 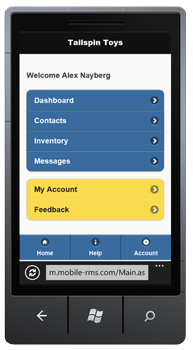 Create and edit work orders and quotes, mobileRMS will automatically adjust stock to commited. Great feature for creating sales on the road and recalling back at the office. Sent internal messages to your staff while youre out of the office. * Features are dependant on your Dynamics Software.